Unlike much of the world which sticks to only a few regional varieties of wine, California seems to take on just about every style and varietal. Many times, they wineries in California tend to make boozier cousins to their European counterparts, but hey, that's not necessarily a bad thing. Zinfandel is one such wine that is typically a little boozier than average, due to its high sugar content. And yes, I know, many people prefer White Zinfandel (which is actually a rose') with its overt sweetness and girlish attitude. White Zin actually sells six times as many bottles annually as standard Zinfandel. Sad. Very sad. Especially considering how good the red Zinfandels can be. 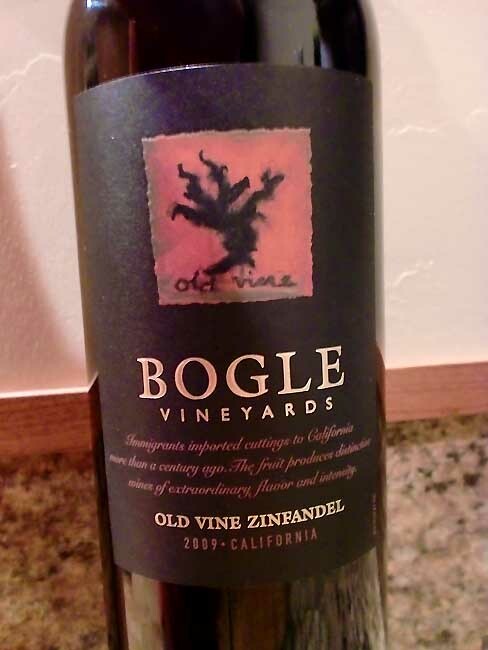 Bogle Vineyards make an Old Vine Zinfandel from cuttings reportedly brought to California over 100 years ago. Does having old vineyards make for better wine? I'm not so sure, but many people tend to think so, and hey, it's a good story if nothing else. The 2009 Bogle Old Vine Zinfandel pours a dark violet. It has aromas of strawberries and dark, dry cherries. On the palette, I get strong raspberries, an interesting herbal quality almost like parsley, a decent amount of oak, black pepper, and what I would call an almost stone, minerally, earthy taste, that was much better than it sounds. The tannins are fairly chewy and drying. This is a big wine to be sure, but not as over-the-top oaky as many Zinfandels. The berry notes stand strong in the forefront here. Drink This: if you want a deep, complex Zinfandel that is more fruit-forward than the usual Zinfandel, with less oak than average. Personally, I find this to be my preferred balance of fruit-to-oak in a Zinfandel, but hey that's just me. It's still has quite a bit more oak than your average red wine. Don't Drink This: if you're expecting it to taste anything like White Zinfandel. It does not. Not at all. And thank goodness. This sounds interesting. I can't wait to try this Zinfandel!